Is this the greatest Stonehenge film ever made? Perhaps not (though no obvious other candidates spring to mind) but it’s worth asking. 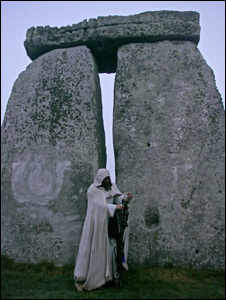 What it certainly is, is quite different from any Stonehenge film you will see made today. In fact it’s so different, the very comparison is an object lesson in thinking and communicating about the past, and in broadcasting history. I’ve just watched Paul Johnstone’s 30-minute 1954 film for the BBC TV series Buried Treasure, called, simply, Stonehenge. It’s in black and white, of course, and it mixes studio talk with outdoor film sequences. It’s powerfully different from a modern film.